I feel like I need to address something before I begin this. Yes, this is the illustrious 50th post. No, there is no prize. You’ll be fine without one. What I really want to talk to you about is the fact that most people use the name “Frankenstein” improperly. Not saying that you do or not everyone reading this does, but lots of people do. Frankenstein is not a monster. He does not have an imposing brow and neck bolts and he does not walk around stiff legged with his arms straight out in an attempt to grab and strangle victims. He is not stitched together by a mad scientist and brought to life by the powers of God or nature or whatever dogma you happen to subscribe to. Frankenstein is the man that build the monster that did all of those things. Frankenstein is a scientist. He created a monster. Frankenstein’s monster is the monster Frankenstein created. I’ve never read Mary Shelley’s Frankenstein. It’s the truth. I read a bit of it, but it just didn’t grab me like….. well, like “Frankenstein” should. But, I have seen the movie with Boris Karloff a couple times, so I consider myself an expert. Also, I watched part of Abbott and Costello meet Frankenstein when I was younger. So, we’re good on all bases. Anyway, I have always thought Karloff’s portrayal of Frankenstein’s monster, while definitely different from the one describe by Shelley, overtook that description to become the image of the monster that everyone thinks of. Shelley says the creature was 8 feet tall, had a grotesque yellowish skin pulled tightly so that it “barely disguised the workings of the vessels and muscles underneath”, black lips, white teeth, “flowing” black hair. Also, remember back to the way the monster walked. Stiff legged. Lumbering. It was like a Nazi goosestepping and keeping diarrhea at bay while walking through the house with paint on his hand from repainting the back porch brown. He didn’t want to get any brown on the curtains, and I’m not just talking about the paint. However, Shelley talked of the monster having flexibility and speed that surpassed that of any human as if the creature was some sort of superhuman. Prometheus was a titan, a sort of superhuman, that stole fire from Zeus, gave it to humans and had his organs plucked out by birds for eternity. Why the changes? Maybe it was easier to make for film. Maybe lumbering was more suspenseful than springy. Maybe make just sucked so they changed it. I don’t really know, but I know that I do like Karloff’s portrayal. 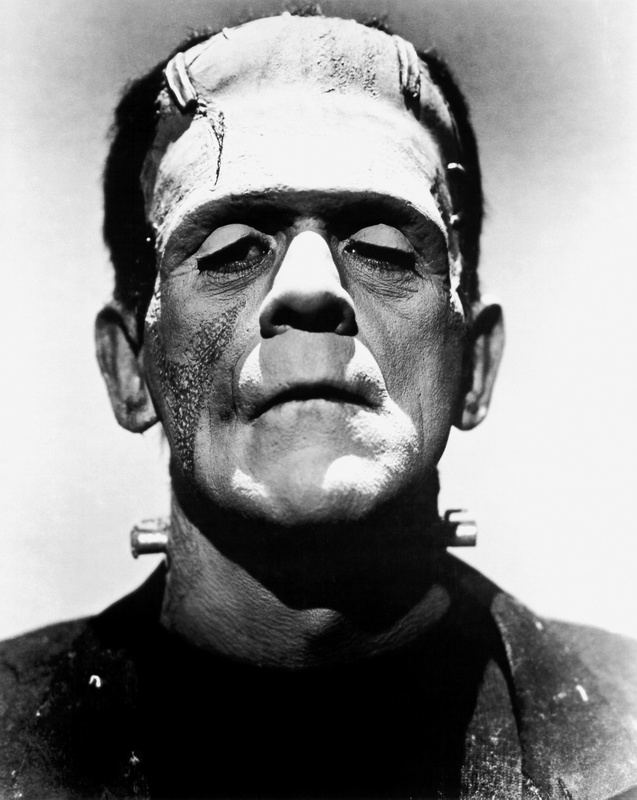 He’s become the icon, so everyone knows Frankenstein as Karloff now. Thanks to Emily Kersey for the challenge. She doesn’t submit them that often, so I had to make this one special. Also, it just happened to be post number 50. If only I had a GetGlue sticker to give…. This entry was posted on	February 20, 2012 at 12:00 pm	and is filed under Books, Movies.